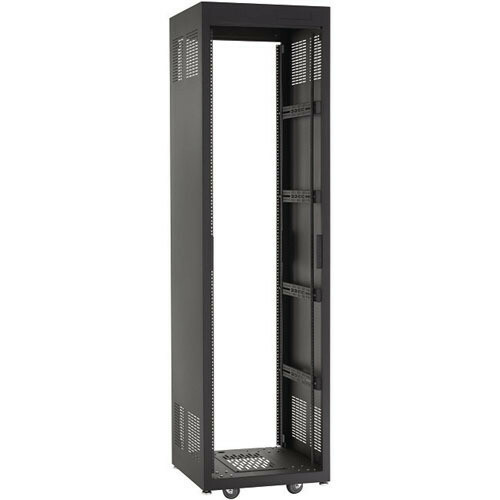 The Raxxess NE1F2028 Free-Standing E1 Enclosed Rack (20 U Tall, 28" Deep), with a ventilated bottom cover panel, allows you to effortlessly mount small components on the bottom of the rack or use that extra space for cable entry. Included adjustable rear rack rail for cable management hides the cable, providing a clean clutter-free look to any installation. Laser cut knockouts make your installation simpler. Dual 3 U panels in the top of the rack work with a wide range of passive and active thermal management solutions. The Free-Standing E1 Enclosed Rack boasts a welded steel construction with a black wrinkle powder coat finish.